Celebrating the sale of Project Alida with Heesen Yachts | In the photo: Thomas Conboy, Sara Gioanola and Team Heesen and Barin Cardenas president/ founder The New Yachts Company, as seen on TNYC Facebook page. Heesen Yachts in the Netherlands has received a new order for the construction of project Alida, a 55m motoryacht. Barin Cardenas, president of The New Yachts Company (TNYC), introduced and represented the buyer. TNYC worked closely with Thom Conboy of Heesen Yachts USA. Built to Lloyd’s class, Alida is a fast displacement motoryacht with a steel hull pencilled by naval architect Van Oossanen and aluminium superstructure. Radyca, a Miami-based design firm, is in charge of the interior styling. The vessel has been designed to provide sleeping for up to 12 guests in a 250sq m accommodation space including a full beam VIP cabin, a full beam master suite and four double cabins. She also offers numerous possibilities for entertainment at sea, from a 110sq m sundeck to a skylounge that is wrapped almost entirely in glass. Cardenas also announced that its Brand Ambassador programme has brought top tier partners into the fold, allowing The New Yachts Company “to share our knowledge and guidance with premium builders and brands aligned with our vision for excellence in yachting”, he says. Equipped with twin MTU 8V 4000 M63 engines would provide Alida a maximum speed of 16 knots, and a range of 4,500 nautical miles at cruise. Heesen says Alida offers “frugal fuel consumption coupled with a remarkable range of 4.500nm at 13 knots, while her top speed reaches 16 knots. At 12 knots her range becomes ever more impressive reaching 5.400 nm”, the yard says in a statement. The yacht will undergo intensive sea trials in the North Sea prior to delivery to her new owners in time for cruising in July 2017. 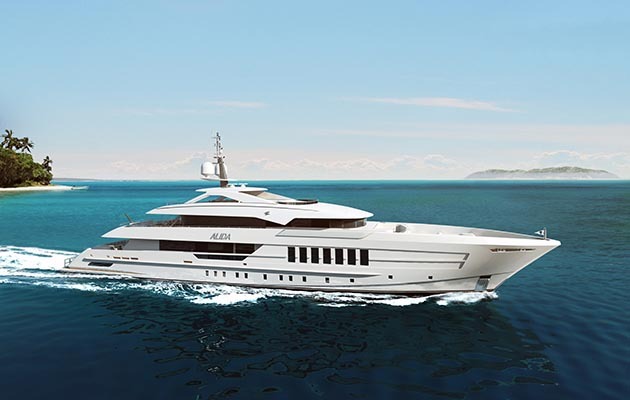 Both companies announced the sale of project Alida at the Palm Beach International Show.